Beginning with version 8.5.3, when a 'Requester' is added to a request/job, the information for this requester is saved in the database so that the next time you have a job that is requested by that person, you don't need to type it in again, you may type in a few characters and the name will be suggested to you. In the past, you had to click the 'New' button and type in the information. This lead to occasional duplicate names and blank names. That is now a thing of the past. However, there are still these possible duplicates remaining in the database. Also, there are cases where the requester no longer is part of your customer's organization and you do not want them to be used. These things can now be managed. 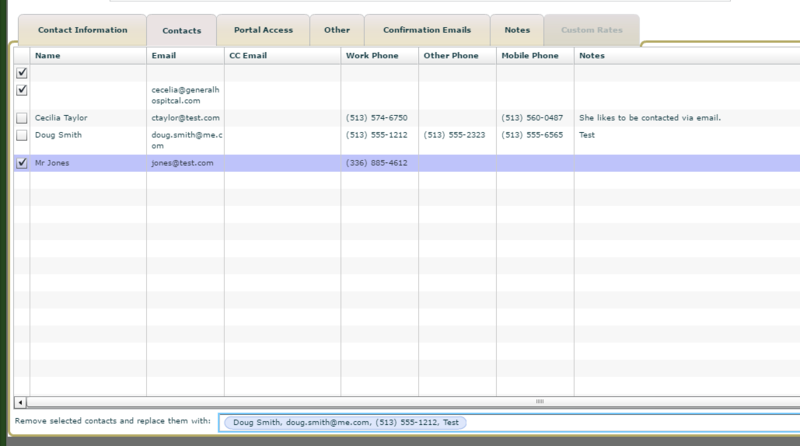 If you start typing a name into the 'Contact Name:' field as shown above, it is now a type ahead field like for Customer, Language and other similar fields and will display suggestions from the database. If you type in a new name that is not currently associated with this customer, you will get a notice that a new contact will be added to the database. If you have typed in a sufficient amount to have the desired nave as a suggestion, just select it. In either case, if you add or change information in the fields below the contact name, when you save the request, this information will be saved or updated as appropriate. In the above list there are two contacts that were inadvertently created with a blank name and one, Mr. Jones, that we no longer want to use. To get them off the list, we are going to merge them with a good contact, Doug Smith. To do this, click the check boxes next to the ones we want to remove and in the field below this grid, start to type in the name of the contact you want to replace these. It is a type ahead field so it is easy to select the survivor. In this case it is Doug Smith. When you click the 'Replace' button to the right of the field you just put the survivor in and confirm you want to proceed, the names above that you selected will be gone. All requests that contained that requester will be replaced with the surviving requester and a log entry will be made for the request which will show when the change was made and by whom.